I love having opinions… because they’re mine. If something is yours, you can do whatever you want with it. If you read my post “Hyperrealism” you may gather that I don’t like that type of art, well I have a footnote to that post. I don’t much get the idea of recreating something that looks exactly like a photograph, BUT if it’s done at a larger scale, I think it’s pretty amazing. The work of these two artists is pretty amazing. 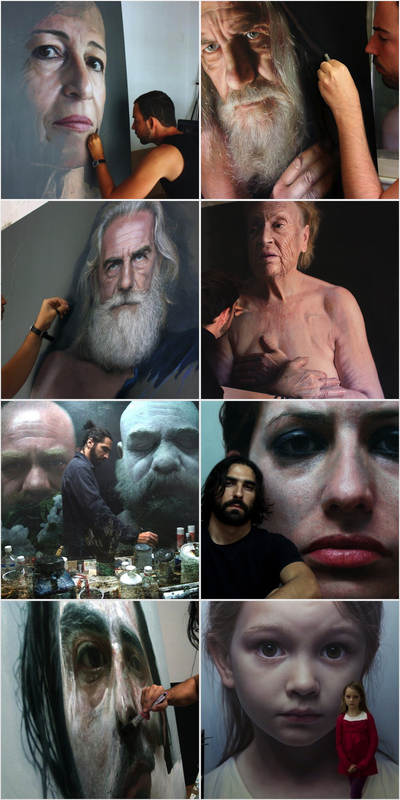 Eloy Morales and Ruben Belloso Adorna both do portraits that are much larger than life size. Often with things that are created in larger scales, proportion is off in places. Both artist’s work is spot on. There are some great videos of their process if you search on YouTube. Their Facebook pages are filled with wonderful images of their work and processes.